The Ultimate Body Massager by Body Trip is a simple massage device that resembles a hand held rake. Don’t let appearances fool you though; it feels amazing on a variety of body parts (head, back, legs, maybe even feet!). The metal is cold when you first use it, which is sure to cause chills. Simple, easy to use, easy to clean, feels amazing. Prongs may weaken with excessive bending. The Body Trip Ultimate Body Massager looks like a rake to be honest. 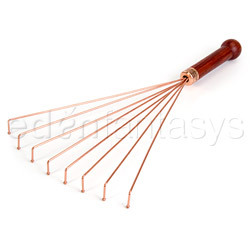 A copper rake with a wooden handle. A high quality rake with a good solid wood handle which is connected very well to adjustable metal prongs. This rake also feels, quite frankly, amazing! It comes in a simple plastic container with some brief instructions on the back. I quickly took out my new massage toy and separated the prongs in preparation of using it on my partner. The metal is very cold at first, so running it down your partners back will surely send shivers up their spine. Add that to the way the prongs actually feel and it makes for one exciting back massage. Adding warm massage oil (a candle massager, perhaps?) is also very enjoyable with the combination of the cold prongs and warm oil. Because the materials are very smooth, some soap and water will clean this up quite well. Also using rubbing alcohol on the prongs may be a good idea. Because the prongs can be easily adjusted, my partner loves squeeze them closer together and use it on her scalp. Because of the long prongs, if it gets a little tangled in her hair, it’s usually easy to just pull it down, much like brushing her hair. Just watch out for your eyes! The packaging suggests using it on your feet, and if you’re not ticklish like we are, you may actually enjoy the sensations. It also makes an incredible “scratcher” for those hard to reach places. And because the prongs are dulled, no worries about accidentally breaking the skin. Wow. I think this would just tickle me stupid, but I'm glad ya'll liked it. Can you apply different amounts of pressure with this? Looks like a tickle torture device hehehe. How about care for the wooden handle (in the case where it gets oily, etc)? Is it coated with some sort of protecting varnish? Paired with a blindfold, I think this would be just amazing! Naughty Student- The handle is coated in a varnish. Wiping it down with soap & water cleaned it very well. Thanks for the review! Seems great! Great review. Seems like fun! This seems like it would be absolutely wonderful as a back scratcher! Thank you for the informative review on this interesting product. Thanks for the review. Good information. Thank you for viewing Happy's body trip – metal body massager review page!